Here are instructions on storing your bank account and/or credit card information on our site. In order to save bank account or credit card information on myschoolaccount.com, you have two options. You may either enter a bank account or credit card through the Manage My Account section of the site, or you may choose to save your payment information when making a deposit. 1 - From the dashboard, click the Manage My Account button at the top of the page. 2 - Under the Banks and Cards section, click the Add Account button. You can also edit an existing bank account or credit card by clicking the Edit button next to the corresponding account/card. You will see the screen pictured below. 1 - Choose the ACH option from the Account Type dropdown menu. 2 - Enter the Alias for the account. 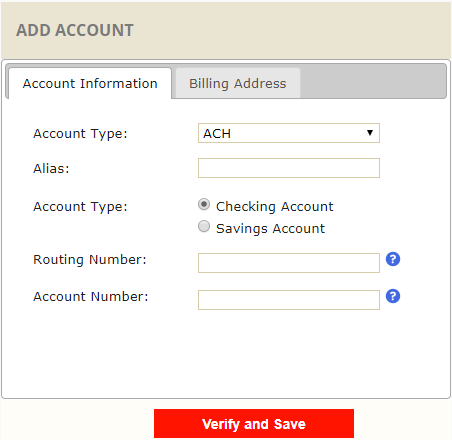 3 - Choose the Account Type (savings or checking). 4 - Enter the Routing Number and Account Number. 5 - Click the Billing Address tab and enter the required information. 6 - When finished, click the Verify and Save button. Choose the Credit Card option from the Account Type dropdown menu. Enter the Alias for the account. Enter the First and Last Name, Credit Card Number, CVV, and Expiration Date for the card. 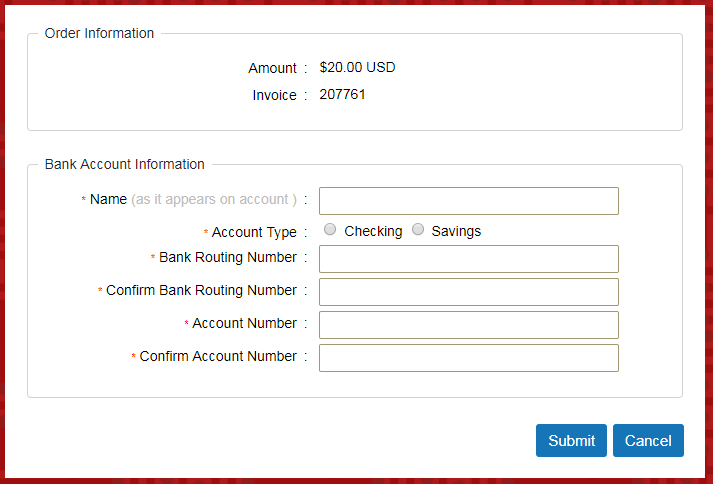 Click the Billing Address tab and enter the address associated with the account. When finished, click the Verify and Save button. 1 - From the dashboard, click the Deposit Funds button. After entering your payment amount, you will be required to enter your Payment Method. To add a new bank account or credit card, select the appropriate payment method (Checking Account Debit, Savings Account Debit, or Credit Card/Debit Card). 2 - Click the Make Deposit button. 3 - Here, you will enter your Payment Method. Select either Use New ACH Account or Use New Credit Card Account. 4 - Enter the Alias for the account. 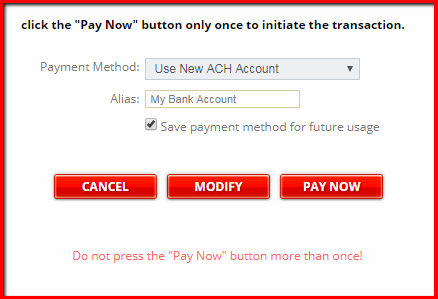 5 - Check the Save payment method for future usage box. 6 - When you click Pay Now, you will be prompted to enter the information for the bank account or credit card. Click the Submit button to finalize the transaction and save the information.